Coral reef tipping points: Overfishing, nutrient input, sediment and climate change have caused dramatic declines in reef health worldwide. 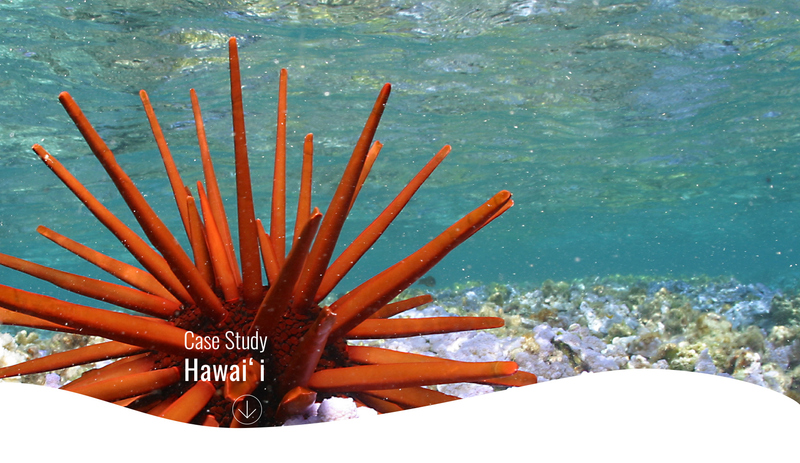 Reefs of Hawaii: Understanding causes and warning signs of reef tipping points can help prioritize management actions and monitoring strategies, and inform conservation and restoration targets. Characterizing regimes: The view that coral reefs are either healthy and coral-dominated, or unhealthy and algal-dominated, is overly simplistic for Hawaiian reefs, which can exist in multiple different ecosystem states. Linking to drivers: New techniques allow us to disentangle the environmental and human drivers associated with these different states. Quantifying the threshold levels of drivers that lead to reef shifts can help to inform appropriate management targets. Evaluating tradeoffs: Tradeoff analysis highlights cost-effective management options and the value of cooperation among land-owners in addressing land based source pollution to protect nearshore reefs.